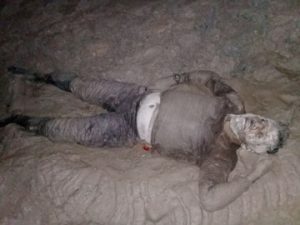 A member of Venezuela’s notorious Syndicato gang was reportedly killed after members of a local security service came under attack Wednesday night. According to reports, the attack happened at around 22:00 hrs on Wednesday at a mining camp located in the Cuyuni Black Water Area, in Region Seven. It was reported that six men surrounded the camp and began to open fire. However, quick response by the camp security, which is attached to the Sherriff Security Services, kept the attackers at bay. One of the attackers was shot during the crossfire but none of the miners in the camp were injured. The body was still there yesterday afternoon. 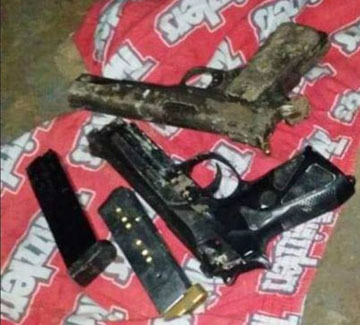 Three handguns were recovered from the scene with matching bullets, along with one magazine of AK 47 rounds. Commander of the ‘F’ Division, Senior Superintendent, Kevin Adonis, confirmed that the police are investigating the matter.